The Open Access article processing charges dataverse is now open with two initial files that describe the sample of journals from DOAJ used for the May 2014 OA article processing fee census. 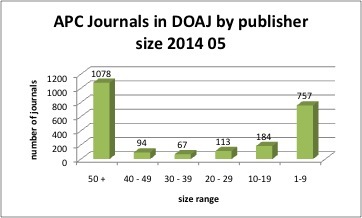 DOAJ publishers has charges 2014 05: this is a list of journals in DOAJ as of mid-May 2014 that “has charges” (sic – term used in DOAJ). This is the result of a screen scrape from a DOAJ Advanced Search screen as this field was not available in the DOAJ metadata on the census date. DOAJ journals by APC pub size is a list of publishers in DOAJ that “has charges” in descending order by the number of journals using the article processing fee method. This analysis made it possible to identify the skewed distribution of this set of journals, with publishers tending to be large (50% APC journals) or small (1-9 journals, with 1 being the most common number by far). DOAJ metadata files – the files downloaded from the DOAJ website for use in this study are posted. There are 3 csv files, from Nov. 2013 (used for the Nov. – Dec. 2013 pilot project); April 2014 (not used to date but retained as this dataset was downloaded before DOAJ removed APC information from the downloadable file) and May 14, 2014 (the dataset the 2014 census will focus on). If you are citing these files please note that you should cite DOAJ as well as this dataverse, and point readers to the current DOAJ metadata file for download. Additional files will be released as time permits and as the work of collating results from various sources progresses. The files are in CSV format to permit for easy manipulation. Thanks to the University of Ottawa Library and the Ontario Council of University Libraries’ Scholars Portal for the dataverse! Of the minority of journals in DOAJ that have article processing charges (26 – 30%) , most (80%) are published either by publishers that have 50 or more journals that use APCs, or 1 – 9 journals that use APCs, with not much in the middle. Of the publishers with 1 – 9 journals using APCs, by far the largest category of this group (83%) are one-off journals, i.e. the publisher has only one journal using APCs. This is a skewed distribution. This finding supports the distribution found by Frantsvåg (2010), although unlike Frantsvåg I do not see the large number of small publishers as a problem, but rather, as suggested by Edgar and Willinsky (2010), a possible indication of a renaissance of scholar-led publishing. This distribution also fits the pattern for scholarly journal publishers overall described by Crow (2006). This is very similar to the findings of Thompson (2005, p. 63),who found through a major study of scholarly monograph publishers in several English-speaking countries, a tendency towards concentration and larger publishers combined with a healthy system of very small publishers, but not much in the middle. We hear a lot about the big publishers using APCs, like BioMedCentral and Hindawi, but not as much about the many small publishers. For this reason, it is the smaller journals and publishers that I most want to highlight. Thanks to Ian Song from Simon Fraser University for providing this information about the OA APC charged by Hans Publishers’ Hans Journal of Neurotechnology (in Chinese). This is published separately as a good illustration of the variety of models within the article processing fee approach. The processing fee is 1,900 Chinese Yuan (about 328 Canadian dollars) for 8 pages. If an article is more than 8 pages, 100 Chinese Yuan per page will be added to the extra pages. For good quality articles (reviewed by the committee) from low income authors, the charge can be reduced (does not mention how much). If the first author is a student, the student can get 20% off. This is the first time I’ve seen discounts specified for quality articles and student discounts, although clearly quality is a factor for other publishers as many offer such options as language (generally English) editing for an additional fee. The per-page charge for long articles is one that is used by other publishers. When you think about it, this makes sense; if we’re paying for the service of publishing, it makes sense that the amount varies depending on how much work is needed. The Dramatic Growth of Open Access series was updated June 30, 2014 by Heather Morrison and Jihane Salhab. Highlights this quarter include charts that demonstrate more than half a million items funded by the U.S. National Institutes of Health that are now freely available, and indications that the Public Access Policy is working – after 3 years, NIH funded items are more than twice as likely to be open access than any item regardless of funding. Bravo to India’s DBT / DST on their proposed open access policy! One of the keys to building and sustaining a global knowledge commons is good public open access policy. This post is a response to the Open Access Policy Committee of India’s Department of Biotechnology and Department of Science and Biotechnology on a proposed open access policy that is very forward-thinking in many respects and might be considered a new standard for open access policy for the world. Congratulations to the Open Access Policy Committee for a proposed policy that can be considered a new model for the world in almost every respect! 1. After this sentence on page 1: “Grantees can make their papers open-access by publishing in an open-access journal or, if they choose to publish in a subscription journal, by posting the final accepted manuscript to an online repository”, this sentence were added: “Grantees who publish in an open-access journal should post the final published manuscript to an online repository based in India”. Rationale: journals and publishers are free to come and go and change business models as they please. A journal that is open access today could cease to exist, or be sold to a publisher that uses a toll access business model in the future. The only way to ensure ongoing open access to publicly funded research is through the use of repositories under the direct or indirect control of the funding agency. 2.	p. 2: “Suggest that the period of embargo be no greater than one year” – change “Suggest” to “Insist”, and add this phrase: “Future revisions of this policy will look to decreasing and eventually eliminating accommodation for publisher embargoes”. “Suggest” to “Insist”: the experience of one early open access policy leader, the U.S. National Institutes of Health, illustrated very well that certain publishers will take every advantage of any policy loophole available. The 2004 policy merely requiring open access had a dismal compliance rate; this changed dramatically with the strong 2008 policy. If researchers have options, publishers will refuse open access or demand longer embargoes. If policies are strong, publishers adjust as can be easily observed through the Sherpa RoMEO Publisher Copyright Policies and Self-Archiving service, which illustrates the shifting landscape of scholarly publishing overall towards compliance with open access policy as well as concessions for specific policies. “Decreasing and eventually eliminating publisher embargoes”: the purpose of permitting publisher embargoes is to give the industry time to adjust. Publishers have now had more than a decade to adjust to open access policies around the world, including many by the world’s largest research funders. There are now close to 10,000 fully open access peer-reviewed scholarly journals, employing a variety of business models, including commercial operations that are quite successful financially. There is no reason for publishers to continue to need the “training wheels” support of embargo periods indefinitely. There is no reason to delay the advance of research by one year at every step. We need clean energy solutions and answers to tough questions like climate change today. Since scientific advance is incremental in nature, a one-year embargo at every step towards an advance can mean an actual delay of many years in achieving a breakthrough. p. 1: “DBT/DST will not underwrite article processing charges levied by some journals”. Bravo! The purpose of public funding of research is and should be to facilitate the conduct of research, not to subsidize secondary support services such as scholarly publishing. The priority for DBT/DST funding should be ensuring that India’s research facilities are state of the art and providing salaries for Indian researchers and support for Indian students. Also, there are areas (with this policy being a good example) where government policy is the best approach, and other areas that are best left to the market. It is appropriate for governments to direct researchers benefiting from public funding to make their work openly accessible. However, there are reasons to leave business models to the market. One reason is that commercial companies employing the article processing fee method are likely to be subject to the same market forces that caused distortion in the subscriptions market, and targeted government funding in this area could easily exacerbate the problem. Another is that currently many publishers using the open access article processing fee approach provide waivers for authors from developing countries; this may even be the default. This information is from my research in progress (my apologies that my data is not yet ready to share; it will be posted as open data as soon as it is ready). If governments provide funding for authors from developing countries for article processing fees, this concession may well disappear and have a severe impact on authors without the benefit of such funds. Bravo! This is the approach recommended by the San Francisco Declaration on Research Assessment http://am.ascb.org/dora/, and an approach that I heartily support. Among other things, heavy reliance on the impact factor as surrogate for quality of academic work has been a factor in market distortion in scholarly publishing. Also, reliance on impact factor has been an incentive for scholars to focus on topics of interest to high impact factor journals generally based in developed countries. For scholars in the developing world, this is an incentive to redirect focus from problems and issues of local concern to topics of interest to the developed world. This has also been a disincentive to development of local scholarly publishing systems. The ease of publishing on the internet means that it is timely for scholars in India and elsewhere to consider growing local scholarly publishing initiatives, providing opportunities for local leadership, outlets for research on topics of particular interest to India, and taking advantage of local currency and economic conditions to get the best deal on publishing services. In summary, India’s DBT/DST proposed open access policy is sound, innovative, and in my expert opinion, sets a new standard for the world. The two recommendations for improvement is to ensure that all articles are deposited in a local open access repository, including articles published in open access journals (which may in future cease to exist, change ownership or business model), and to insist on rather than suggest an embargo of no more than one year with language indicating eventual elimination of embargoes. Particular strengths highlighted are the refusal to provide funds for article processing fees and the direction to consider the quality of the work, not the impact factor of the journal in which it is published. Following is the call for participation for Resource Requirements interviews (e-mail and social media). Êtes-vous un(e) lettré(e) impliqué dans la publication libre accès à but non lucratif (d’une à trois revue(s) savante(s), des actes de conférence occasionnels, ou la publication à petite échelle de monographie)? Ou, voudrait votre maison d’édition à petite échelle changer à libre accès, si on peut changer le soutien pour les opérations? Si la réponse est oui, je vous invite à participer à un entretien (à peu pres la moitié de l’heure ou une heure) conçu pour déterminer plus des ressources nécessaires pour soutenir ce type de publication libre accès. Les résultats des entrevues faire une base pour plus de recherche, incluant étude de cas et focus groupes, comme preparation pour un projet plus grand sur les économies d’une transition global ver libre accès. Il est probable que les résultats de cette recherche seront utile pour le développement des affaires pour publication libre accès, est que les résultats vont informer le bon politique libre accès. Les participants peuvent choisir si leurs contributions seront anonymes et confidentiels ou libre accès et reconnues. Are you a scholar involved in small not-for-profit open access publishing (from one to three journals, occasional conference proceedings, or small-scale monograph publishing)? Or, would your small not-for-profit publishing operation like to switch to open access if the economic logistics can be worked out? If so, you are invited to participate in an interview (half hour to an hour) designed to further flesh out the resource requirements needed to sustain this kind of open access publishing. Results of these interviews will form the basis for further research, including case studies and focus groups, in preparation for a larger project on the economics of global transition to open access. It is anticipated that results of this study will be useful in the development of business practices for open access publishing, and inform open access policy. Participants can choose whether their contributions will be anonymous and confidential or open and acknowledged.